I arrived in London a couple days before my steeple prelim at World Champs feeling good. I was breathing in all that oxygen after being up at altitude for 6 weeks in St. Moritz and knew I was in shape to easily make the final and even have a shot at being on the podium. I was put in the first heat of 3 in the prelims on Wed, Aug 9th. On paper it was the toughest heat of the three with four women having run under 9:20 and only the top 3 finishers automatically qualifying to the final (plus the next 5 fastest times overall). The race played out very differently than I imagined. There were two Kenyan women in my race who immediately both went to the front and ran side by side at a very slow pace, blocking the rest of the field behind them. I am proud of the way I stayed calm in this strange situation and just tucked in behind them, finding gaps to see the hurdles and running mostly on the inside lane (the shortest route possible). Since the pace was so slow I knew that I would have to be top 3 to qualify to the final, so I was saving my energy and waiting for a pace change and a fast last lap. This is exactly what happened- we jogged around for 6.5 laps then sprinted the last 400m. I felt strong going into that last lap, through the water and over the last barrier I easily picked off one more place to finish in the top 3. I remember crossing the line feeling strong and powerful, not gassed at all from the effort. While I was frustrated with the way the Kenyan women decided to run, I was proud of the race I ran and felt good about recovering for the final in 2 days. 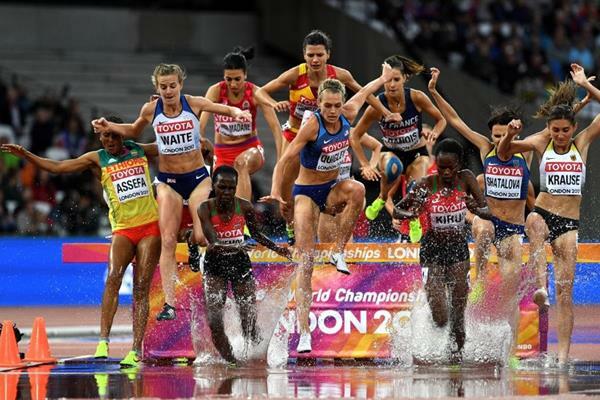 Unfortunately, this slow pace in the prelim made for some hectic water pits as all the women in the field scrambled to jump the water and find a safe spot to run while being so closely packed together. Amidst this chaos, I swerved to the left on the turn after the second to last water jump and my left foot landed halfway on the inside line (where there is no rail, only intermittent orange cones). An IAAF official saw this step on the line and reported it as a disqualification, citing that I had gained an advantage with this step. Even though I ran a smart race, sitting on the slow pace and waiting for the last lap to open up and sprint home to the 3rd auto-qualifying spot, I later found out I had been disqualified and would not be allowed to run in the final on Friday. While my coaches, agent, and Team USA managers adamantly fought the ruling on my behalf, the IAAF officials would not budge, insisting that I had gained an advantage by stepping on the line on a curve and the ruling was upheld. They even found that one of the orange cones that lined the curve (where there is no inside rail) was out of place. While the other cones were placed on the line, with the edge of the cone lining up with the inside of the line, the cone next to where I stepped on the line had been moved back, off of the white line. The IAAF rulebook cites that these cones are to be placed on the white line when there is no rail (as is the case after some steeplechase pits). Despite this fault on behalf of the officials on the field, the IAAF decided that my fault of stepping on the line was greater than their fault of misplacing the cone. All day Thursday I waited as my case was being reviewed, but by Thursday evening I had gotten news that our appeal had been denied and I would not be allowed to represent my country the next day. On Friday I sat in the stands and watched my fellow USA teammates finish 1-2 for the first time in USA history. Emma Coburn had won a bronze medal in Rio last year and my teammate Courtney placed 11th last summer. They both ran with heart and and both broke the previous American record. With Evan Jager's bronze in the men's steeple earlier that week, Team USA won more medals at Worlds in the steeplechase than Team Kenya! An incredible feat. The American track community went nuts! 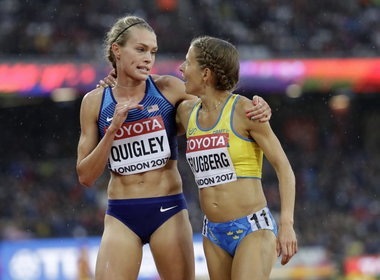 It was an amazing race by both Emma and Courtney and was a thing of beauty to watch. On the home stretch, tears started streaming down my face- both tears of joy and tears of extreme sadness. I was witnessing history, but I wanted to BE history. There was an outpouring of support from the track community on my behalf, for which I am very grateful. My heart was hurting so much, but I knew that I wasn't the only one feeling wronged, robbed, and upset about the ruling. I cannot say thank you enough to everyone who reached out on social media and otherwise to let me know they were on my side, thinking of me, and supporting me. I licked my wounds for a couple days for sure, but you can't keep me down for long. I knew I still had some good opportunities to compete over the next few weeks of the summer, and I didn't want those to go to waste because I felt sorry for myself. I had trained ALL YEAR for this summer of racing! I knew I still had a lot of fitness I had not been able to show the world yet, so it was back to training and prepping for my next races. After London I was able to bounce back a bit and do two more races on the track. I went to Birmingham, England for my first every Diamond League 1500m race. My 4:03 in Heusden earlier this summer got me a bid into the race along with my teammate, Shelby Houlihan. I finished 9th in a stacked field with a time of 4:06, still 5 seconds faster than my previous PR. 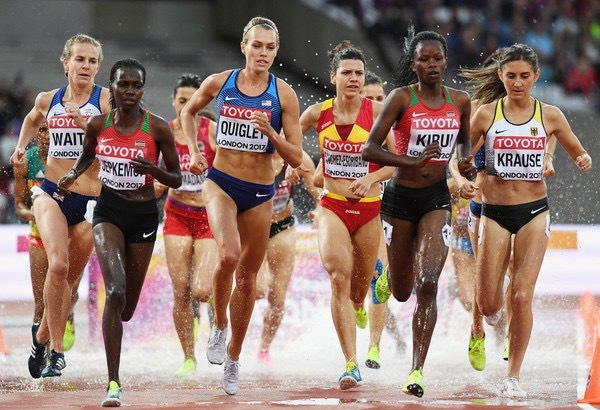 Next I went to Berlin to run one more steeplechase at the IAA World Challenge meet. My teammate Courtney paced the race through 2k to set it up for me and make sure it went fast. She did an awesome job and we went through 2k right at 9:12 pace. I unfortunately didn't have the last 1k in my legs I was hoping for, but settled for 9:15, still a 5 second PR, but definitely less than I was hoping for and less than I knew I was capable of. However, this steady and gradual improvement on my times is a trend that I've seen throughout my whole career and I do believe that there is something to be said for that. While I would have been OVER THE MOON about a medal in London this summer (let there be no doubt about that), I know that I am still on my way towards my goals and that this experience will only motivate me to continue working harder than ever. And hopefully when I do get to stand on that podium in 2 years from now or 3 years from now, it will be that much sweeter.